More than 850 undergraduate, graduate, and law students will participate in commencement ceremonies Friday, May 16, Saturday, May 17, and Sunday, May 18. The 2013-2014 academic year concludes yet another chapter of the University’s proven excellence in education, leadership, faith, and service. – Valpo welcomed the largest incoming class in 36 years, with 1,100 new undergraduate students and total enrollment of 4,500. – The 85th annual Opening Convocation invited all new students to come forward and sign the student-initiated Honor Code: I have neither given or received, nor have I tolerated others’ use of unauthorized aid. The pledge, which has remained intact for 70 years, signifies the students’ commitment to academic integrity and to holding themselves and others to the highest standard. – For the 25th straight year, Valparaiso University was identified as one of the best universities in the Midwest by U.S. News & World Report magazine. 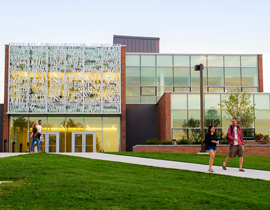 In the 2014 edition, Valpo is ranked as one of the top 10 Best Regional Universities among more than 140 institutions in the category. – Valparaiso University was listed as No. 8 in Affordable Colleges Online’s rankings of the top colleges and universities in Indiana for the greatest lifetime return on investment. – Valparaiso University was named to Victory Media’s Military Friendly Schools list, which honors the top 20 percent of colleges, universities, and trade schools in the country that are doing the most to embrace America’s military service members, veterans and spouses as students and ensure their success on campus. – President Heckler kicked off an alumni tour to 20 cities across the United States. – The United States Department of Energy awarded Valparaiso University a $2.3 million cooperative agreement to fund solar research through a proposal from the College of Engineering. Part of the Modern Electro-Thermochemical Advancements for Light-metal Systems project, Valpo is the only organization in the state of Indiana to receive this funding. – The James S. Markiewicz Solar Energy Research Facility (SERF) was dedicated Sept. 27. 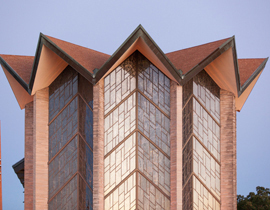 The SERF is one of just five research facilities – and the only undergraduate institution – in the United States that has a solar furnace. 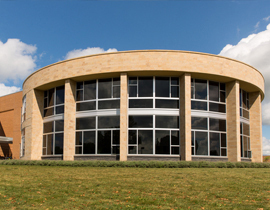 – The Phyllis and Richard Duesenberg Welcome Center was dedicated Sept. 28, serving as the official gateway to campus. The building, which is a total of 15,000 square feet, includes a breathtaking main entrance that features “Lightfall,” a mosaic interpreting Valparaiso University’s motto: In Thy Light, We See Light. – Kiplinger’s Personal Finance recognized Valparaiso University as one of the top 100 private colleges in the nation for best value. – Valpo hosted the inaugural Jochum Chair Lecture with the Rev. John Nunes, featuring distinguished Lutheran scholar and author the Rev. Martin Marty. – Valparaiso University achieved recognition from the United States Department of State as one of the colleges and universities that graduated the most 2013-2014 Fulbright United States students. The Fulbright Program is the United States government’s flagship international educational exchange program. – The Bach Institute at Valparaiso University was honored to host the boys choir of St. Thomas Church in Leipzig, Germany, as it kicked off its United States tour. – Regarded as an expert on solar energy research, Robert Palumbo ’80, Ph.D., professor of mechanical engineering and Alfred W. Sieving Chair of Engineering at Valparaiso University, achieved national recognition as the 2013 Indiana Professor of the Year. – Valparaiso University Director of Athletics Mark LaBarbera announced Dave Cecchini was hired as the 17th head football coach in school history. – Valparaiso University and head men’s basketball coach Bryce Drew, a 1998 Valpo graduate, reached an agreement on a new, 10-year contract. – Valparaiso University sophomore Jonathan Cisneros became the 2013 recipient of a “Realizing the Dream” scholarship from the Independent Colleges of Indiana (ICI). – More than 200 Valpo students performed in the 80th annual Christmas Concert at the Chapel of the Resurrection and the famed Orchestra Hall at Symphony Center in Chicago Dec. 6-8. – The annual Advent Christmas Vespers on Dec. 13 featured the Kantorei Choir and the Handbell Choir of the Chapel of the Resurrection. A traditional evening of scriptural readings and inspiring music, the year’s theme was “A Visit” and featured the art of John August Swanson and a newly composed choral work, “Home,” by acclaimed composer Libby Larsen. – The illustrious Benjamin A. Gilman International Scholarship Program honored five undergraduate students at Valparaiso University with awards to study abroad in spring 2014. Since 2009, 13 Valpo students have received this award. – The College of Business at Valparaiso University developed a new major in business analytics, joining an emerging trend in higher education seeking to address a growing marketplace need. The program builds on the College’s history of developing ethical professionals who are leaders in their fields. The Valparaiso University College of Business is accredited by the Association to Advance Collegiate Schools of Business, placing it among the top 5 percent of business schools internationally. – In commemoration of the 50th anniversary of King’s “I Have a Dream” speech and the March on Washington for Jobs and Freedom, Valpo honored “The Beloved Community” through speakers, presenters, and activities that promoted the respect and value of racial diversity on campus, as well as within the broader community, through dialogue and discourse, art and music, and food and faith. – The Valpo Fraternity and Sorority community raised more than $24,000 at the second annual Dance Marathon for Lurie Children’s Hospital. – Lara Pudwell was named a 2014 winner of the Henry L. Alder Award for Distinguished Teaching by a Beginning College or University Mathematics Faculty Member. – Valparaiso University graduate Cheryl Schrader ’84 E.E., Ph.D., was recognized as an IEEE Fellow for her leadership and contributions in engineering education. Schrader is a past president of the IEEE Control Systems Society and the current chancellor of the Missouri University of Science and Technology.The Institute of Electrical and Electronics Engineers (IEEE) is the world’s largest professional association dedicated to advancing technological innovation and excellence for the benefit of humanity. – Valparaiso University announced Mark L. Biermann, Ph.D., will join the University as incoming Provost and Executive Vice President for Academic Affairs effective July 1, 2014. – Students, faculty and staff dedicated spring break to service through trips to Harvey, Ill.; Detroit; Pine Ridge, S.D. ; New Orleans; and Hicksville, N.Y.
– Christ College, the Honors College of Valparaiso University, presented the inaugural Shakespeare Week at Valpo, featuring a weeklong residency by Actors From The London Stage. – Jesse Fosheim and Marshall Miller were both recipients of the North-American Interfraternity Council (NIC) Undergraduate Award of Distinction. This was the first time in the award’s history that two recipients are from the same university. – The University celebrated its first-ever “Proud to be Valpo” day of giving raising $285,674 from 1,885 donors and exceeding the initial goal of 600 donors by nearly 300 percent. 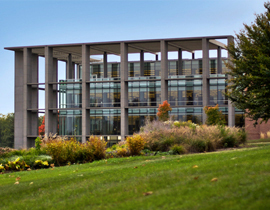 – The Office of Integrated Marketing and Communications at Valparaiso University was named a Silver (the highest honor) and Bronze winner in the 35th Annual Telly Awards for their advertisement titled “Where Passion Meets Purpose.” There were nearly 12,000 entries from all 50 states and numerous countries. – Valparaiso University celebrated the groundbreaking of the addition to the Chapel of the Resurrection. – The James S. Markiewicz Solar Energy Research Facility and the groundbreaking solar research at Valparaiso University was featured in The Atlantic. – Valparaiso University celebrates the 21st consecutive year of graduate placement rates higher than 90 percent, with 92.5 percent of 2012-2013 graduates employed or in graduate school within six months of graduation. – Phillip Powell, Ed.D., will begin his term as special assistant to the provost for inclusion effective June 1. In his role, Powell will work closely with students, faculty, staff, and community members to explore opportunities and develop a proactive and positive strategy to make Valparaiso a more inclusive and welcoming community. – Andrea D. Lyon, J.D., will join its faculty as dean of the Law School, effective June 2. Most recently, Lyon has served as the associate dean for clinical programs at DePaul University College of Law in Chicago. – Valpo will host the 2014 Innovators Café June 19, co-sponsored by the College of Engineering and Ivy Tech Community College Northwest. The event celebrates the creativity and innovation exhibited by faculty and staff in developing the engineering leaders of tomorrow. Mark Maassell, vice president of the Indiana Energy Association and former president of NIPSCO, will serve as keynote speaker. – Valparaiso University Provost Mark R. Schwehn ’67, Ph.D., will retire from his position effective June 30 as Provost and Executive Vice President for Academic Affairs. Schwehn has served the University since 1983 and was named provost in 2009. – Jennifer A. Ziegler, Ph.D., will begin her tenure as dean of the Graduate School and Continuing education effective June 30. Ziegler has been a member of Valpo’s faculty since 2007, serving as chair of the communication department from 2011-2012. The 2014-2015 academic year kicks off Aug. 26 with the University’s annual Opening Convocation and Taste of Valpo celebration.